Abelia loves her music. The Harvard 1906 model "talking machine" sits during the summer months on the table on her back porch. She loves sipping wine and listening to music at night, watching the insects swarm around the lamp on her table. In 1917, a new craze was about to hit America. 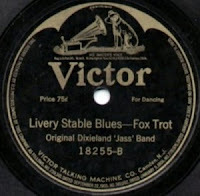 The Original Dixieland Jass Band recorded the first ever jazz record. The record was released on the Victor record label in May and became an instant hit. Jazz had for the first time pushed into the mainstream. Victor Records didn't quite know how to describe the music. In one ad they described it as a "Brass band gone crazy." And then admit quite frankly that they didn't know what a "jass" band is. Last summer, I purchased an original copy of this album on Ebay. So many were sold that they are relatively easy to find. My copy is okay, considering the album is almost 100 years old. I cleaned it up and recorded the song "Livery Stable Blues" into the computer, knowing then that this song was going to become a significant part of the narrative in Lilac Wine. This album helps bring Abelia and Robert together in the novel. Robert had already had a small taste of jazz while witnessing a performance from Fate Marable aboard the paddle wheeler Sidney with his new friend, Billy Miles. Fate Marable was an African American bandleader who traveled up and down the Mississippi River on excursion boats. Due to the mainly white clientele on the excursion boats, however, he was never fully able in 1917 to perform the true jazz from his hometown, New Orleans. He was like countless other jazz initiators who were not recorded until much later. Ironically, the Original Dixieland Jass Band was made up of white musicians. This, in a large part, was due to the inherent racism in the recording industry at the time. Plus, jazz musicians from New Orleans were reluctant early on to have their music recorded for fear of imitation. In the novel, Abelia orders a copy of the album after seeing an ad for it. Robert, working for the Lily Springs post office delivers it. Robert walked into the back yard, a square package under his arm, calling out her name. She hurriedly wiped her hands on an old cloth, straightened her skirt and threw open the door to the greenhouse. “Yes. Thank you,” she replied, taking the flat, heavy cardboard package from his hand. Abelia smiled. “I saw an ad for this one. Brand new. It’s like a ‘brass band gone crazy’ it said. Come on.” She turned and headed up the porch steps, untying the rough hemp string from around the package. Robert followed, removing his straw hat on the shade of the porch. Abelia offered him a seat and disappeared into the house. “How about some lemonade?” she called as the door closed behind her. She returned quickly carrying a tray with a pitcher and two tall glasses. After pouring the lemonade she started to sit---“Oh, the record,” she remembered. She soon returned, pulling the black disk from the sleeve. The Harvard was at its place on the table with “Ave Maria” still on the platter. “This is a record by the Original Dixieland Jass Band,” she said as she switched the disks, carefully setting Alessandro Moreschi on a stack of records next to the talking machine. Abelia let down the tone arm; static as the needle settled into a groove. Then: a cacophony of sound. Cornet, clarinet and trombone in a burst of noise; shrill and disorganized. Then the trombone took up the beat as the crowing coronet voiced the melody. Soon, the clarinet took up the tune, carrying it above the other instruments. It was ostentatious, full of life and energy. The pattern repeated several times, then a brief pause and the cornet whinnied like a horse, the other instruments following with a “moo” and a “cockle-doodle-doo.” Abelia smiled. Robert was tapping his fingers on the top of the table, his lips in a slight grin. He had short sideburns, but hadn’t shaved that morning. Stumble dotted his chin, but his cheeks were relatively smooth. His hair had been neatly combed, but his hat had left a slight crease along the hairline. He hadn’t used a pomade today and as he bounced his head ever so slightly to the beat of the music, strands of hair fell loose and rested upon the crest of his ear. Sweat beaded his forehead and when he casually wiped it with back of his hand, his eyes moved to hers and he smiled. Abelia quickly averted her gaze, the warmth she could feel in her checks. There were several more instances when the instruments took on the sounds of a barn. After each whinny and moo, the tempo picked up pace, the sound became more intense. The music was fun and lively, unlike anything Abelia had in her collection. More than the music, she enjoyed watching Robert. In light of everything that happened in the last week, it was good to see him smiling.